Rarely offered, this is one of the most unusual and stunning ornamental bamboo species, it is a must have bamboo for any Patio or Border. 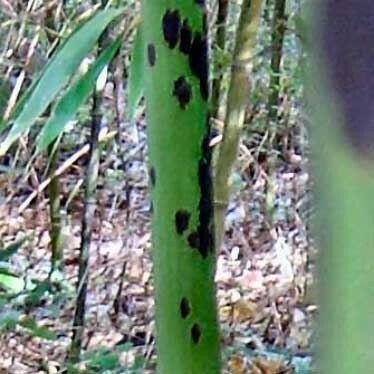 Clump forming with unusual purple brown markings on the green canes and mature branches, it's easy to see how the name leopard bamboo was devised, particularly as the waxy green canes tend to go a yellowish-green colour as they get older, making this Bamboo even more outstanding. For the best display, grow in full sun to partial shade. Supplied at approx 180cms(6ft+) tall in approx 10 litre containers.